I cut the halved lemon shells in half again vertically, covered them with an inch of cold water in a large saucepan, and simmered them until the peel was completely tender, about 40 minutes. I added a little water along the way. I had saved the seeds when I juiced the lemons and tied them in a muslin sack, adding them to the lemon mixture as it was cooling and then stored overnight in the refrigerator. While I was preparing the jars for water bath canning, I sliced the lemon halves into very thin strips, less than 1/16 inch, saving all of the pulp and liquid. I had about 2 cups of peel and liquid and added ¾ of that amount (1½ cups) of sugar. I might have added less, but my mixture was so peel-heavy that I thought it would stand the added sweetness. Sugar also turns to liquid, and this mix was a little dense (in hindsight I might have increased the water). I also added 2 tbsp of very thinly sliced strips of fresh ginger, emulating the shape of the peel. 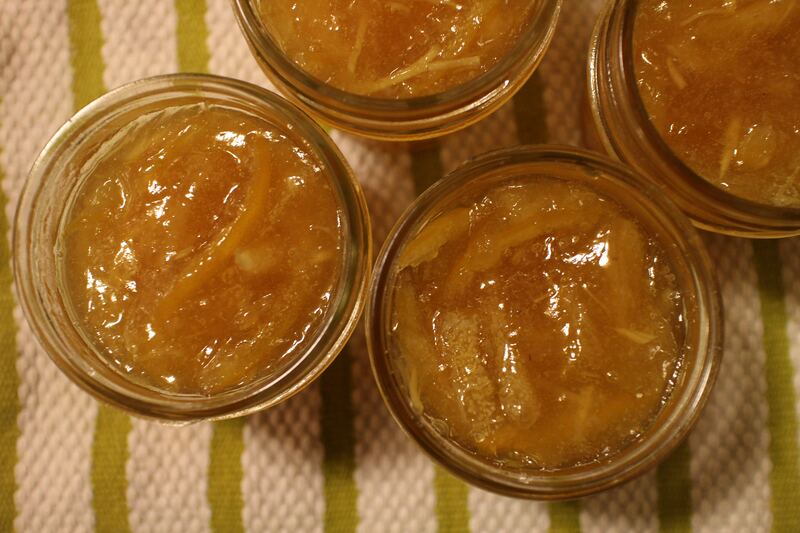 This marmalade had so much natural pectin – from the peel and the seeds – that it gelled in no time, about 5 minutes. In the end I got 5 four-ounce jars of delicious lemon ginger marmalade, nearly one for every lemon.